It was like a pirate’s treasure map. A dotted line clearly showed the trail, but at the end of it, no “X” marked the spot. Then a telltale clue caught Stan Hart’s eye. A cluster of earthquakes in 1995 had rumbled in the place where the “X” should have been–just east of the chain of Samoan Islands in the South Pacific. Was something there after all? Hart and colleagues cruised to Samoa to take a closer look. And there it was, as it had been all along, right where it was supposed to be. 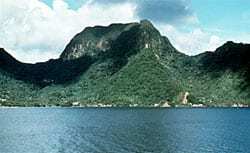 About 27 miles east of Ta’u, the easternmost Samoan island, Hart and company found a 14,300-foot active, submerged volcano. In size and appearance, it resembled Mount Fuji in Japan or Mount Rainier in Washington State (without the snow, of course). But it had remained hidden–buried beneath 2,000 feet of ocean. Sometime in the next millennium, however, the newly named volcano of Vailulu’u will rise above the waves and become the next island in the Samoan chain. “It just blew us away,” said Hart, a Senior Scientist at Woods Hole Oceanographic Institution. He and co-chief scientist Hubert Staudigel of the Scripps Institution of Oceanography had entertained the possibility of finding a modest volcano. Instead, they found a spectacular volcano–one that ranged 21 miles across the seafloor at its base, rose 21/2 miles high, and peaked with an elegant cone-shaped caldera more than a mile wide. But what really makes Vailulu’u such a potential scientific gold mine is that it is no cold relic. On the contrary, it’s truly a hot spot. In geologic terms, a “hot spot” is a dot on Earth’s face where a narrow plume of hot mantle rock rises from deep within the earth, melts, and bursts through the crust. Hot spots beneath oceans create undersea volcanoes that sometimes rise above the ocean surface to form islands. Hot spots remain stationary, but above them, Earth’s outer crustal plates move slowly but inexorably. Imagine moving a sheet of paper horizontally a few inches above a burning candle. Similar to the candle’s flame, a hot spot leaves a scorched trail of volcanic islands on its overlying plate. These island-volcanoes ride atop the migrating plate, at a speed of only about 3 inches per year–about the rate one’s fingernails grow. But over millions of years, even 3 inches per year carries the islands hundreds of miles. As they retreat from the hot spot where they were born, the islands progressively become less volcanically active. As they cool, they erode and may subside back beneath the waves to become extinct seamounts. The Hawaiian Islands are the classic example. The big island of Hawaii emerged most recently. The Kilauea volcano on Hawaii is still very active, but the crust below the island has already begun to drift west of the hot spot. Just east of Hawaii, more squarely atop the hot spot, is the undersea volcano Loihi, whose erupting lava will eventually pile up above the ocean surface and extend the eastern end of the Big Island. West of Hawaii, the islands are progressively farther from the hot spot and older. Beyond the oldest island, Kauai, the northwestern Hawaiian islands barely poke out of the surf. (Former President Bill Clinton recently declared them a coral reef sanctuary.) Still farther out are the Emperor Seamounts–former islands now in their submerged dotage. They create a dotted undersea trail that leads almost to Russia. At first glance, Samoa also seemed like a classic hot spot chain that included (west to east) the islands of Savai’i, Upolu, Tutuila, Ofu, Olosega, and Ta’u. But both Savai’i and Ta’u had erupted this century. That violated the rule of diminishing volcanism as islands move away from a hot spot. The major conflict to the hot spot theory, however, was the apparent absence of an active volcano next in line, just east of Ta’u. Lacking this “smoking gun,” geologists sought another mechanism to explain the existence of the Samoan Islands. 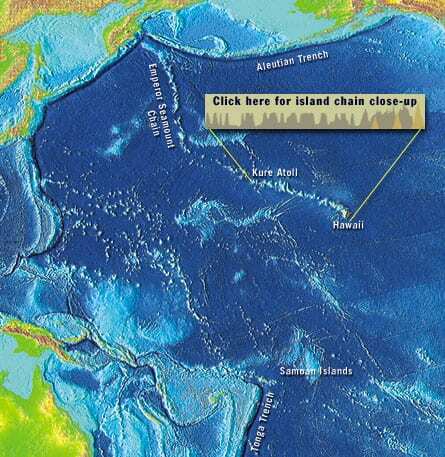 They noted that the islands aligned with the northern plate boundary of Tonga Trench, a vast slab of the Pacific Plate that is colliding with the neighboring Indo-Australian Plate and plunging beneath it. The downward pulling of the Pacific Plate, they said, stretched and bulged the plate. That created cracks and channels for underlying mantle rock to rise, melt, erupt, and form islands at the surface. The dilemma remained unresolved. In lieu of an ambitious undersea search, Hart and MIT/WHOI Joint Program student Alberto Saal looked closely at seafloor maps created with data gathered by satellites. With extraordinary precision, the satellites can measure centimeter-scale differences in the height of the ocean’s surface. These heights, in turn, reflect the gravitational pull of structures on the seafloor below. A massive undersea volcano, for example, exerts a gravitational pull that attracts water and creates a small but often measurable bulge in the sea surface above it. But a bit of scientific serendipity ensued. The satellite maps of the area that Saal retrieved also included data on any earth-shaking seismic events recorded in the region. These events are caused by earthquakes, undersea landslides, or volcanic eruptions. The maps showed that a swarm of seismic events occurred in 1995 around what appeared in the satellite maps to be an unremarkable, easily overlooked seafloor bump off Ta’u. Digging deeper, Hart uncovered records of another similar swarm in the same area in 1973. It was almost as if the volcano, unseen in the dark depths, was screaming to be heard. Heeding the seismic clarion, Hart assembled a team of scientists that included Staudigel of Scripps, Saal and Senior Scientist Mark Kurz from WHOI, and Hart’s former graduate student Erik Hauri, now at Carnegie Institution of Washington. They persuaded the National Science Foundation to fund a cruise to Samoa in the spring of 1999. Aboard the Scripps research vessel Melville, detailed sonar mapping of the area revealed the true size and height of the volcano east of Ta’u and the stunning perfection of its summit caldera. The team also dredged lava rock samples, whose pristine glassy veneer and sulphurous odor offered clear evidence that the volcano may have erupted very recently. “It seemed an appropriate name since the size of the volcano was a surprise and wasn’t at all what it appeared to be on the available ocean floor maps of the area,” Hart said. No doubt, the exhilaration of discovery brought out the oceanographers’ irreverent, swashbuckling sides. Less loosely translated, “fa’afafine” in Samoan means “transvestite.” Clearly, the new volcano required a more fitting name. Hart surveyed scientific literature for previous mentions of the volcano. As it turned out, Rockne Hart Johnson, a geophysicist at the University of Hawaii, studied seismic waves recorded by hydrophones in the Pacific Ocean during the 1960s and 1970s. In 1973, hydrophones recorded 26 explosions over a 1/2-hour period east of the Samoan Islands chain. Supported by a National Geographic Society grant, Johnson sailed two years later to the area to search for the source of the seismic events. Using an echosounder and a magnetometer aboard the 63-foot motor-ketch Kawamee, he reported finding a major seamount some 2,000 feet below sea level. He had no means at the time to verify if the seamount was active. He called the seamount Rockne Volcano. That didn’t seem like an ideal appellation, either. So Hart helped organize a naming contest among students in American Samoa. Taulealo Vaofusi from Samoa High School submitted the winning entry, which was announced during the islands’ centennial Flag Day celebration on April 21, 2000. The name of the new volcano and future Samoan island is Vailulu’u. The word describes the sacred sprinkling of rain that reportedly always fell as a blessing before a gathering of King Tuimanu’a, the last king of the Samoan nation. Back in their labs, the team compared lava dredged from Vailulu’u to samples from the other Samoan Islands. Much the way biochemists track genes to determine people’s heredity, geochemists can analyze chemical isotopes in rocks to identify their family lineage. The rocks from all the islands and the new undersea volcano were, chemically speaking, the progeny of the same mantle source. What’s more, the shape of the volcanoes, from the westernmost island of Savai’i to the new volcano, were progressively more youthful in appearance. Add in the fact that the new volcano’s location veered too far away from the Tonga Trench to be influenced by it, and the evidence all pointed to the existence of a Samoan hot spot. Hart and company still could not explain why some of the older islands in the Samoan chain, unlike their Hawaiian counterparts, remain volcanically active. Hawaii may be the classic hot spot, but perhaps each individual hot spot has its own slightly quirky mantle plumbing system and modus operandi. The scientists had found what was really down there. The next step was to find what was really going on down there. More specifically, they were eager to prove that Vailulu’u was still active. Unfortunately, finding a research ship in the vicinity for a follow-up cruise isn’t as easy as flagging a taxi. So Hart sort of stuck out his thumb. He found out that the US Coast Guard’s 430-foot icebreaker Polar Star would pass right by Samoa the following March–returning to Seattle from its annual southern hemispheric summer voyage to resupply the US scientific station in Antarctica. The Coast Guard graciously agreed to let Hart and colleagues rendezvous in Samoa and come aboard to conduct several days of research. 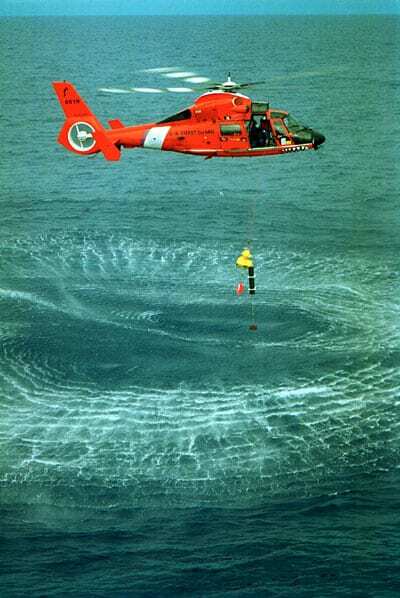 Helicopters from Polar Star picked up Hart, Staudigel, and David Willoughby, also of Scripps, on Fiji in March 2000. The next day, the ship arrived atop Vailulu’u, where the scientists lowered into the crater a CTD (conductivity/temperature/depth) instrument, which measures water temperature and salinity, and a nephelometer, which measures particulate matter in the water. As soon as the instruments entered the volcano’s crater, they recorded abnormally warm temperatures and high turbidity levels in the water. Samples from water within the crater also had much-higher-than-normal levels of the element manganese. It was clear evidence of volcanic activity. Hot, buoyant fluids were escaping from the seafloor within the crater. The hot fluids dissolve minerals from volcanic rocks. When the hydrothermal fluids hit cold seawater, the minerals precipitate instantly, filling the water with particles like a smokestack belching smog into the air. The hot, chemical-rich fluids presumably also create a haven for microorganisms, which produce a different, but no less abundant, stream of particulate matter. As the instruments descended into the crater, the water became increasingly hotter and smoggier. Polar Star also circumnavigated the crater using the “tow-yo” technique. As the ship towed a CTD and nephelometer, the instruments’ cable was alternately reeled upward and downward, like a yo-yo. By sampling outside the crater, the scientists also discovered that hot, smoggy water from the crater was spilling over the top or through breaches in the crater rim and billowing outward. It formed a halo around the rim that was hundreds of feet thick and extended more than 4 miles. Before departing, Hart and company left a few calling cards. They deployed five ocean-bottom hydrophones–four around the crater and one in it–to detect sound waves generated by eruptions or earthquakes. The hydrophones lingered and listened, recording seismic events far more sensitively than faraway land-based seismometers ever could. In March 2001, when Polar Sea, another Coast Guard icebreaker, returned from an annual Antarctic pilgrimage, it retrieved the hydrophones–with a full year’s worth of previously undetectable rumblings from Vailulu’u. Now, Hart’s team hopes to persuade funding agencies to take the next step–mounting an expedition to lower exploratory robotic vehicles into the billowing cauldron of the volcano’s 1,300-foot-deep crater. The idea is to use WHOI’s DSL-120 sonar to map the crater floor in great detail and to search for what would be the first hydrothermal vents ever found within an undersea mid-plate volcano. Do such vents exist in this unique environment? Would they look and operate differently from vents found elsewhere on the seafloor? Would they generate a different sort of ecosystem where previously undiscovered species and communities might thrive? To answer these questions, WHOI’s tethered robot Jason II would be deployed to take a closer look, using its camera “eyes” to see and its “arms” to collect samples. Hart and company have good reason to believe that they will find something completely new–because no volcano exactly like Vailulu’u has ever been discovered on Earth. It’s a geological gem whose ideal shape offers scientists unprecedented opportunities to witness the ubiquitous, but hard-to-capture phenomenon of undersea volcanism, as well as to take a rare peek deep into Earth’s interior. Human beings have almost no access to the great heat engine that drives and shapes the face of their planet–the mantle. Its boundary begins several miles below even the thinnest part of Earth’s crust, and it extends thousands of miles deep, all the way to Earth’s core. It is a vast vat of hot, highly pressurized plastic rock that continually boils up and churns around like a stew in a pressure cooker. We get only tantalizing glimpses of the processes going on down there in places where material from the mantle melts and bursts through the crust–at volcanoes, for example, or at the globe-encircling mid-ocean ridges, where buoyant magma upwells in the seams between tectonic plates. The magma is quenched to create new ocean floor. As new seafloor crust spreads outward on both sides of the ridges, it expands ocean basins, rends continents and drives them apart, and shoves plates into collisions that generate mountain ranges, islands, volcanoes, and earthquakes. Hart and other mantle geochemists have analyzed long-lived radioactive isotopes in lava from mid-ocean ridges and volcanic islands throughout the world. They have determined that all ridge lava is similar and probably emanates from the top of the mantle. But they have also identified three other “families” of mantle rocks from oceanic islands–each chemically distinct from ridge rocks and from one another. Much like the various races of humankind, these rocks remained distinct because they resided and evolved separately from one another over long time periods. Thus, the three pedigrees of rocks probably originate from segregated, deep realms within the mantle, perhaps even as deep as the core-mantle boundary. By tracing the rocks’ lineage backward in time and downward into the mantle, scientists-detectives such as Hart hope to unveil how the mantle works and how it has evolved. Not a day goes by without a few volcanoes erupting somewhere on the always active mid-ocean ridges, but they don’t offer ideal conditions for studying the underlying mantle. Magma flows beneath the ridges in all directions over thousands of seafloor miles. Hydrothermal vent fluids on ridges are instantly swept away by currents. In short, ridges are just too widespread and wide open for scientists ever to be able to measure and constrain all the variables and grasp the big picture. On the other hand, a volcano erupting within a plate offers almost a surgical incision. Hot spot volcanoes, in particular, often sit atop long, narrow plumes that can reach into deeper regions of the mantle and billions of years back in time. When they erupt, they can bring up rare gases that were created when the solar system was just born and that have been sealed in the mantle ever since. Hot spot volcanoes above water are convenient to study, but their scientifically precious gases are quickly dispersed into the air. Beneath the sea, however, thousands of feet of water pressure keep those rare gases in solution. That’s why an active, undersea, hot spot volcano is such a rare find for scientists. Conveniently located off Hawaii, Loihi has been the only such volcano to be studied in any detail. Now this may sound politically incorrect, but it is certainly geologically correct: Loihi is an inelegant mongrel of a submarine volcano. It is attached to the Big Island of Hawaii and has bumps and pits that together comprise no distinct shape. Its lava is a mixed breed, coming from a variety of sources in the mantle. In contrast, Vailulu’u lava is one of the three scientifically interesting pedigrees from deep mantle regions. And unlike Loihi, Vailulu’u is isolated and gloriously crowned with an enclosed crater. Near to port and not very deep, Vailulu’u is also relatively convenient. In his wildest scientific fantasies, Hart envisions wiring Vailulu’u with instruments to continuously monitor all the interacting physical, chemical, and biological phenomena that occur where volcanism and oceans combine. Hart sees Vailulu’u as a natural laboratory to observe Earth’s unique fundamental processes. Once established, the laboratory would be poised to capture something that humankind has never witnessed before–the eruption of a great undersea volcano. “Presumably there’s an incantation to make a volcano blow,” Hart joked. 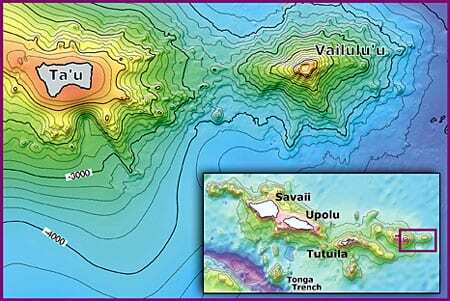 The newly discovered active volcano Vailulu'u rises 14,300 feet from the Pacific Ocean seafloor near the Samoan Islands. It ranges 21 miles at its base and is crowned with a mile-wide caldera that is 2,000 feet below the ocean surface.